Hillsborough Community College provides opportunities for creative minds and quirky ideas from students and professors to join together and show the world what they have to offer. Our college, with its five campuses, cheers on their students as they put their artistic abilities to the test. As you read through our 2018 edition of the Triad, I hope you will marvel at the beauty of the students’ pieces which they have created with their hearts. 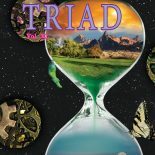 I teach a Reading class in HCC EAP Department and would appreciate if you can make it possible to read stories online from TRIAD 2018 edition, so that the class can go online and read one of the stories there. Hello Ms. Zaks, TRIAD 2018 is up and posted. Thank you, I hope your class enjoys the reading. This entry was posted on February 13, 2019 by hcctriadme in Cover.